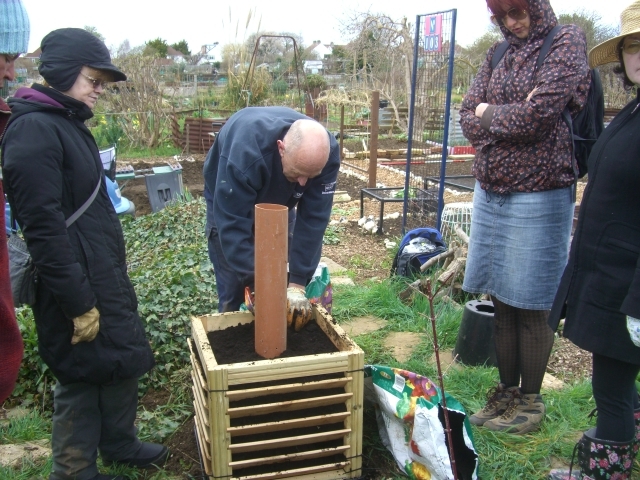 The two agricubes on plot #103 are being used as part of the workshop season, so the first group of workshoppers, who met on 18 March, helped to fill a cube and to plant it up. Constructing the cube was easy, and we put the second one together on the plot with no problems. Watering will not be easy, especially with a hosepipe ban. We opted for a drainpipe filled with stones and with downward facing holes drilled into it, to act as a water feed system. 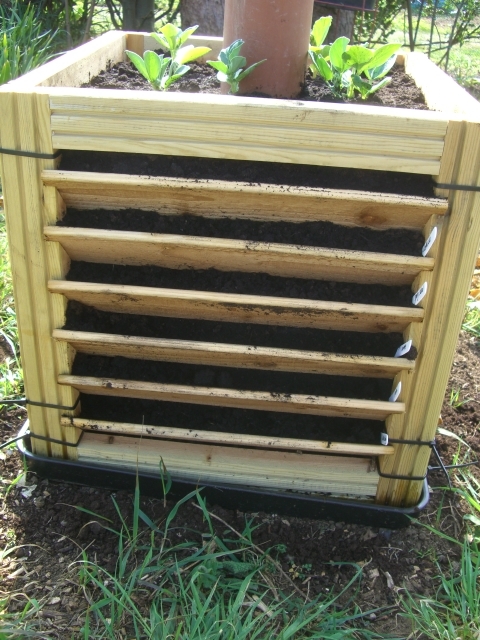 Planting seeds between the slats was hit and miss – next time we will try using a seed planter to get an even row, but even then, getting the right amount of soil coverage over the seeds was tricky. We wondered about the performance of the four sides of the planter: the north side will get very little light, the south side will get a lot of sun and the east side is exposed to prevailing winds. We planted the same crop in the same slat on each side to compare growth and a short row of the same seeds in open ground as a control. 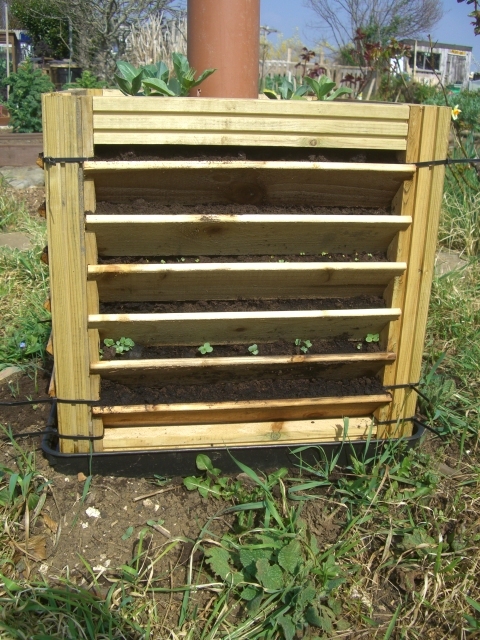 To date we have spring onions, radishes, spicy salad, green salad and carrots, with some leftover broad bean seedlings planted in the top along with limnanthes seeds to encourage ladybirds to visit the planter. The seedlings on the north and south sides as photographed on 29 March tell an interesting story! North side has zero germination, south side has a good germination of radish and spicy salad leaves. The east side is considerably drier than the others and has needed direct watering twice, while the other sides are still damp. 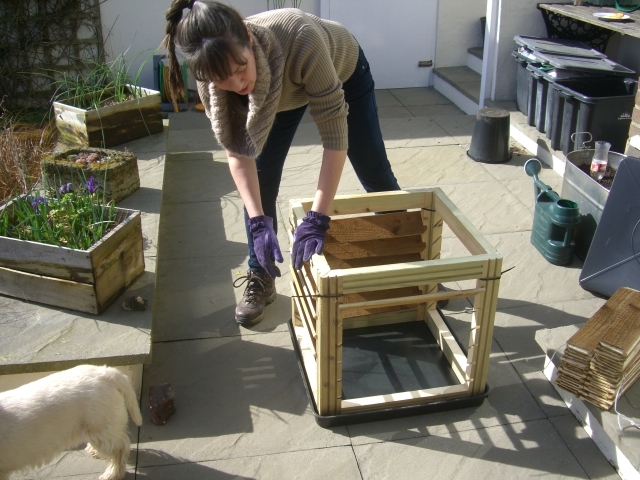 The second agricube will be planted with seedlings to try and measure the value of a cube for all year round growing, and we’ll have information on that one in the next report!